DP ESPAÑOL: Esta historia entra en la categoría “Doble Post” donde indico artículos que han sido escritos tanto en español en El Lobo Rayado como en inglés en The Lined Wolf. DP ENGLISH: This story belongs to the series “Double Post” which indicates posts that have been written both in English in The Lined Wolf and in Spanish in El Lobo Rayado. Next April 2016 the Calar Alto Legacy Integral Field spectroscopy Area (CALIFA) survey will make public to the international astronomical community the datacubes belonging to 600 galaxies observed by this survey using the PMAS (Potsdam Multi Aperture Spectrophotometer) spectrograph, that is installed at the 3.5m Telescope at Calar Alto Observatory (Almería, Spain). The release of the CALIFA DR3 (“Data Release 3”) will be coincident with this interesting Conference in Cozumel (Mexico). I think it is a quite original idea for giving a bit of extra publicity to the CALIFA DR3, don’t you think so? 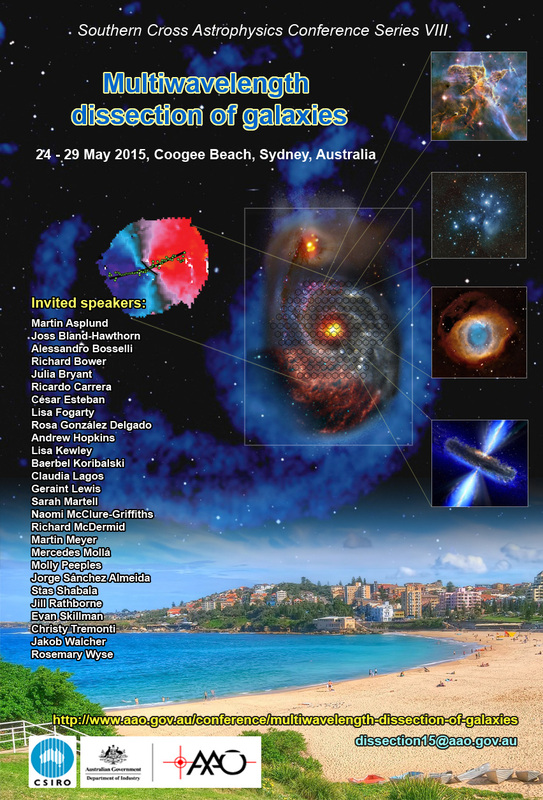 – Dissecting galaxies of the Local Universe with the CALIFA survey, 1 October 2014. Last month the prestigious journal Nature published a letter led by PhD student (and friend) Louise Howes (@Lousie, ANU/RSAA, Australia). This scientific paper, with title Extremely metal-poor stars from the cosmic dawn in the bulge of the Milky Way, uses data from the 1.2m Skymapper Telescope, the 3.9m Anglo-Australian Telescope (both at Siding Spring Observatory, NSW, Australia) and the 6.5m Magellan Clay telescope (Las Campanas Observatory, Chile) to study very old stars in the Milky Way bulge. 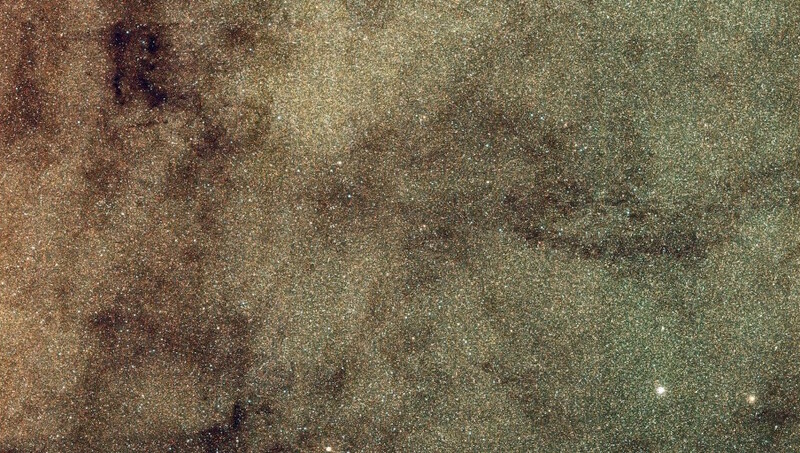 Image of the Galactic centre obtained using Skymapper data. Credit: Chris Owen (ANU/RSAA). The aim of the research was to look for signatures of really old stars: stars that old that perhaps the Milky Was was not even born when they were created! How do astronomers know that? Just studying the chemical composition of the stars via deep spectral analysis. Only hydrogen and helium (and just a bit of litium) were formed in the Big Bang: the rest of elements have been created or inside the stars (oxygen, carbon, nitrogen, iron) or because of processes happening to the stars (e.g., supernova explosions, that create heavy elements such as gold, silver, copper or uranium). As time goes by and new generations of stars are born, the amount of metals (for astronomers, metals are all elements which are not hydrogen and helium) increases. Therefore if we discover a star with very few amount of metals, we will quite sure we are observing a very old object. Loiuse has been using the 2dF instrument at the Anglo-Australian Telescope and the MIKE spectrograph at the Magellan Clay Telescope (Chile) to get deep, high-resolution spectra of candidate old stars in the Galactic bulge. The candidate stars were identified using optical images provided by the 1.2m Skymapper Telescope. With these observations, Louise Howes and collaborators have detected 23 stars that are extremely metal-poor. These stars have surprisingly low levels of carbon, iron and other heavy elements. Indeed, they report the discovery of a star that has an abundance of iron which is 10,000 times lower than that found in the Sun! These stars were formed at redshift greater than 15, that is, we are observing in our own Milky Way stars that were formed just ~300 million years after the Big Bang! On top of that, the study suggests that these first stars didn’t explode as normal supernova but as hypernova: poorly understood explosions of probably rapidly rotating stars producing 10 times as much energy as normal supernovae. The high-resolution spectroscopic data have been also used to study the kinematics of these very old stars, that are found on tight orbits around the Galactic centre rather that being halo stars passing through the bulge. This is also characteristic of stars that were formed at redshifts greater than 15. Short 3 minutes video discussing the results found in this study. Credit: ANU. I’m happy to say here that I’ve been the support astronomer for many of her nights at the AAT the last couple of years. And I’m extremely happy to see that, even because of the bad weather we have had sometimes, they managed to get these observations published in Nature! Well done, Louise! – Scientific paper in Nature: Howes et al. 2015, Extremely metal-poor stars from the cosmic dawn in the bulge of the Milky Way, 11 November 2015. This week I’m back at the Anglo-Australian Telescope (AAT, Siding Spring Observatory) as support astronomer. As the same time I’m helping visitors astronomer to get the best data using the 2dF instrument, I’m taking time-lapse sequences of the night sky using 2 CANON EOS 5D Mark III cameras. This afternoon, when checking the “preliminary” sequences of the previous night, I discovered a bright meteor in one of the frames. I was excited because at the beginning I thought it was a Leonid, but I checked and it seems to be a sporadic meteor or, perhaps, a meteor from the South Taurids shower. 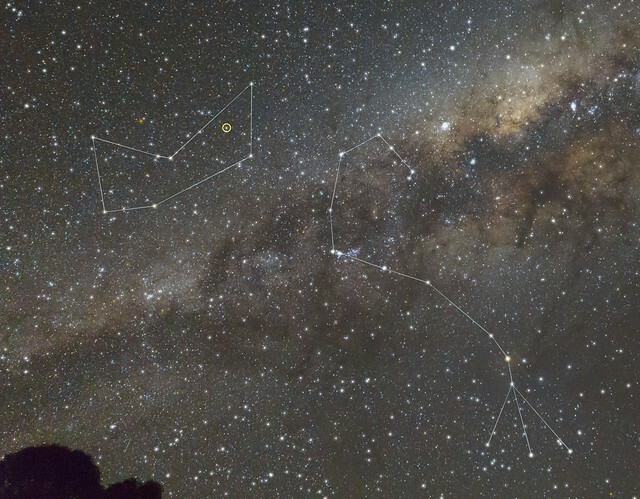 The circumpolar Southern Sky, with the Magellanic Clouds, the Southern Cross and the Pointers (Alpha and Beta Centauri) over the Anglo-Australian Telescope (AAT), at Siding Spring Observatory (NSW, Australia). 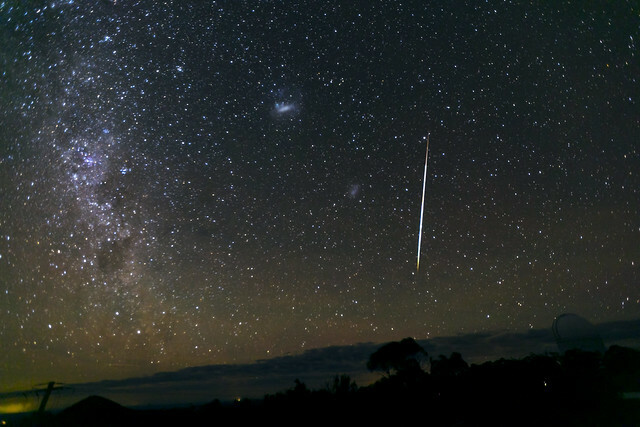 A bright meteor crosses the sky. Although it could have been a meteor of the Leonids meteor shower, the radiant (point in the sky from where the meteors of a meteor shower come from) was not in the sky. However it could be a meteor from the South Taurids shower. Photo taken at 2am AEST (UT+11) of the 17 Nov 2015 with a CANON EOS5D using a 16 mm lens at f2.8, 3200 ISO, 30 seconds exposure. Click here to get a higher resolution image. Credit: Ángel R. López-Sánchez (AAO/MQ). A reddish-greenish sky glow is also seen in the image. This glow has been also observed from the observatories in Chile as is consequence of chemical reactions involving oxygen (green colours, usually forming ozone) and nitrogen (red colours) molecules in our atmosphere. These chemical reactions are induced by ultraviolet emission from the Sun, which is much more intense when the solar cycle is in maximum, as it has been in the last few years. 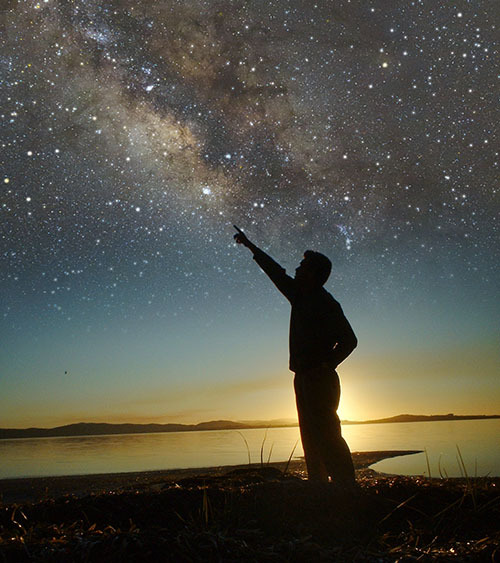 On Friday 21st August 2015, during the Australian National Science Week, the AAO and Centennial Parklands organized a public stargazing event in Centennial Park in Sydney. This event was part of an attempt to break the Guinness World Record for the “Most People Stargazing across Multiples sites in a Country,” organized by Mt Stromlo Observatory, RSAA/ANU, Canberra. I helped in the organization of the event jointly organized by the Australian Astronomical Observatory and Centennial Parklands at Centennial Park. During a 10 minute period between 8:30 and 8:40 pm, 400 participants used small telescopes and binoculars to look at various objects in the night sky. I also prepared this time-lapse video, which compiles 2500 photos taken between 6pm and 9:30pm, shows people assembling in the field to listen to presentations by Prof. Fred Watson and Dr. Amanda Bauer before the official stargazing event began. A timeline of events are included in the video. Time-lapse video of the Stargazing event jointly organized by the Australian Astronomical Observatory and Centennial Parklands at Centennial Park with the aim of break the Guinness World Record for the “Most People Stargazing across Multiples sites in a Country. The video compiles 2500 photos taken every 5 seconds between 6pm and 9:30pm. A Full HD version of the video is available in the AAO YouTube Channel.Credit of the video: Ángel R. López-Sánchez (AAO/MQ); Credit of the music: “Space Guardians”, by Fran Soto, Epic Soul Factory. 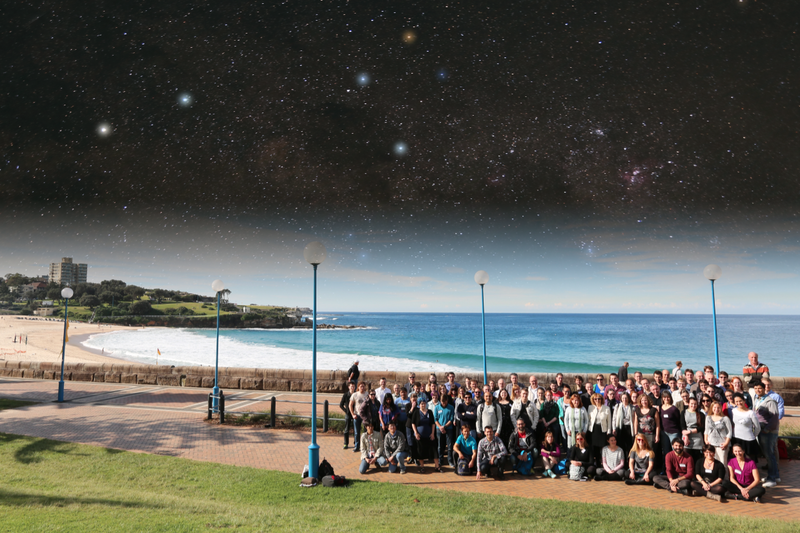 In total, 37 sites across Australia participated in achieving the Guinness Record World, including 7960 individual stargazers. The Guinness World Record for the “Most People Stargazing across Multiples sites in a Country” was confirmed on 15th October 2015. Congratulations to all involved! Story based on the news release about Kathryn’s Wheel I prepared for the Australian Astronomical Observatory webpage. The majority of the galaxies in the Universe can be classified into two well-distinguished classes: spiral galaxies (as our own Milky Way Galaxy) or elliptical galaxies. Spiral galaxies have on-going star-formation activity, possess a lot of young, blue stars, and are rich in gas and dust. However elliptical galaxies are just made up of old stars, with no signs of star formation, gas and dust. Besides these two large galaxy classes, some galaxies are found to have irregular or disturbed morphologies. That is certainly the case of many dwarf galaxies. A disturbed morphology is typically indicating a galaxy that has experienced an interaction with a nearby companion object. Indeed, all galaxies are experiencing interactions and mergers with other galaxies during their life time: the theory currently accepted about how galaxies grow and evolve naturally explains the building of spiral galaxies as mergers of dwarf galaxies, and the birth of an elliptical galaxy after the merger of two spiral galaxies. This will actually be the final destiny of our Milky Way, when it is colliding and merging with the Andromeda galaxy in around 4.5 billions years from now. When galaxies collide, stars and gas are pulled out from them by gravity, and long tails of material stripped from the parent galaxies are formed. Famous galaxies in interaction developing these long “tidal tails” are the Mice Galaxies (NGC 4676) and the Antennae Galaxies (NGC 4038/4039). Very rarely, the geometry of the galaxy encounter is such that a small galaxy passes through the centre of a spiral galaxy creating a collisional ring galaxy. The ring structure is created by a powerful shock wave that sweeps up gas and dust, triggering the formation of new stars as the shock wave moves outwards. The most famous ring galaxy is the Cartwheel (ESO 350-40) galaxy, which is located at 500 million light-years away in the Southern constellation of the Sculptor. However complete ring galaxies are extremely rare in the Universe, only 20 of these objects are known. Images of the interacting galaxies The Mice (NGC 4676), the Antennae Galaxies (NGC 4038/4039), and the Cartwheel (ESO 350-40) galaxy. Credit: The Mice: NASA, H. Ford (JHU), G. Illingworth (UCSC/LO), M.Clampin (STScI), G. Hartig (STScI), the ACS Science Team, and ESA, Antennae Galaxies: Robert Gendler, The Cartwheel: ESA/Hubble & NASA. An international team of astronomers led by Prof. Quentin Parker (The University of Hong Kong / Australian Astronomical Observatory) has discovered a nearby ring galaxy which in some ways is similar to the Cartwheel galaxy but 40 times closer. The system was discovered as part of the observations of the AAO/UK Schmidt Telescope (UKST) Survey for Galactic H-alpha emission. Completed in late 2003, this survey used the 1.2m UKST at Siding Spring Observatory (NSW, Australia) to get wide-field photographic data of the Southern Galactic Plane and the Magellanic Clouds using a H-alpha filter. This special filter is able to trace the gaseous hydrogen (and not the stellar emission) within galaxies, allowing astronomers to detect the ionized gas from nebulae. 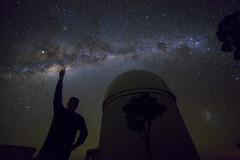 The survey films were scanned by the SuperCosmos measuring machine at the Royal Observatory, Edinburgh (UK), to provide the online digital atlas “SuperCOSMOS H-alpha Survey” (SHS). When using this survey to search for new, undiscovered planetary nebulae (dying stars which often show ring morphologies in nebular emission) in the Milky Way, the team realised that a very peculiar of these structures was actually found around a nearby galaxy, ESO 179-13, located in the Ara (the Altar) constellation. The reason why this magnificent collisional ring structure has been unknown by astronomers is that it is located behind a dense star field (this area of the sky is very close to the Galactic plane, where the majority of the Milky Way stars are located) and very close to a bright foreground star. Discovery images of the “Kathryn’s Wheel” using the data obtained at the 1.2m UKST by the “SuperCOSMOS H-alpha Survey” (SHS). The left panel (SR) shows the red image tracing mainly the stars. The three main components of the system are labelled. 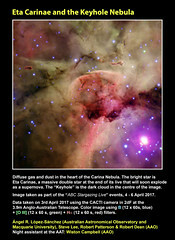 The central panel shows the image using the H-alpha filter (Hα), which sees both the diffuse ionized gas and the stars. The right panel (Hα-SR) shows the continuum-substracted image of the system, revealing for the very first time the intense collisional star-forming ring. Image credit: Quentin Parker / the research team. The discovery SHS images of the system reveal 3 main structures (A, B and C) plus tens of H-alpha emitting knots making the ring. Component A is the remnant of the main galaxy, the collisional ring is centered on it. Component A does not possess ionized gas (that is, it does not have star-formation at the moment). On the other hand, component B seems to be the irregular, dwarf galaxy (“the bullet”) that impacted with the main galaxy. Component B does possess a clumpy and intense H-alpha emission. Astronomers have dubbed this ring galaxy as “Kathryn’s Wheel” in honour of the wife of one of the discoverers, Prof. Albert Zijlstra, (University of Manchester, UK). Kathryn’s Wheel lies at a distance of 30 million light years away, and therefore it is an ideal target for detailed studies aiming to understand how these rare collisional ring galaxies are formed, the physics behind these structures, and their role in galaxy evolution. Interestingly, the collisional ring is not very massive: its mass is only a few thousand million Suns. This is less than ~1% of the Milky Way mass, indicating that ring galaxies can be formed around small galaxies, something that was not considered so far. (Left) Colour image of the collision, made by combining data obtained at the Cerro-Tololo InterAmerican Observatory (CTIO) 4-metre telescope in Chile. The H-alpha image is shown in red and reveals the star-forming ring around the galaxy ESO 179-13, that has been dubbed “Kathryn’s Wheel”. Image credit: Ivan Bojicic / the research team. (Right) Image showing only the pure H-alpha emission of the system highlighting just the areas of active star formation. For clarity any remaining stellar residuals have been removed. Image credit: Quentin Parker / the research team. Furthermore, the galaxy possesses a lot of diffuse, neutral hydrogen in its surroundings. This cold gas is the raw fuel that galaxies need to create new stars. Observations using the 64-m Parkes radiotelescope (“The Dish”, Parkes, NSW) as part of the “HI Parkes All-Sky Survey” (HIPASS) revealed that the amount of neutral gas around Kathryn’s Wheel is similar to the amount of mass found in stars in the system. Astronomers are unsure about from where this cold gas is coming from, although they suspect it mainly belonged to the main galaxy before the collision started. However, as the remnant of the galaxy (component A) does not have star-formation at the moment, it seems that the diffuse gas has been expelled from the centre of the system to the outskirts of the galaxy. The results were published in MNRAS in August 2015. How many words are out there? To date, we know the existence of 1958 planets orbiting around stars different to our Sun. These objects are defined as “exoplanets”: astrophysicists estimate that our Galaxy, the Milky Way, would host trillions of planets. 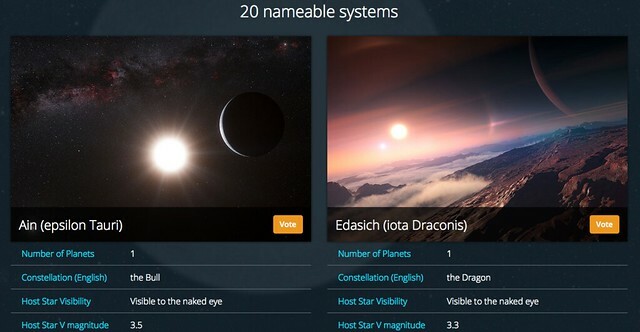 How do we name the exoplanets? Almost the 100% of these names are not proper names but a designation given by letters and numbers coming from star catalogs, such as Kepler 88b or OGLE 2015 BLG 0966b. Following the convention adopted by the International Astronomical Union (IAU), an exoplanet’s name is normally formed by taking the name of its parent star and adding a lowercase letter. The first planet discovered in a system is given the designation “b” and later planets are given subsequent letters. For example, the second planet discovered around star HD 7924 was named HD 7924c. Indeed, these names might be convenient… but they are not easy to remember by the non-astronomers. Screenshot from the #NameExoWorlds website. The hashtag is #NameExoWorlds and the deadline for this is next 31st October. The IAU is expecting a million votes or more worldwide. You can cast your vote just visiting that website, reading the name proposals for each planetary system, and clicking in “Vote” in your favorite option. Only a vote per device and per planetary system in allowed however you can emit your vote using different devices (i.e., laptops, tablets and smartphones). One of the planetary systems that the IAU proposes to give proper name is that located around the star mu Arae (μ Arae). Mu Arae is a star similar to the Sun, located at around 50 light years from us, in the Ara (the Altar) constellation. Mu Arae is slightly older than the Sun (astronomers estimate it has an age of 6.3 billion years), it around 10% more massive than the Sun but around 90% more luminous that the star of the Solar System. We have know for many years that Mu Arae has four planets: mu Arae b, c, d and e. The Sociedad Española de Astronomía (Spanish Astronomical Society, SEA) is promoting the proposal of names given to the star mu Arae and its planets by the Planetarium of Pamplona (Spain). They proposed to name mu Arae as Cervantes, and its planets with the names of the main characters of the Quixote: Quijote (mu Arae b), Dulcinea (mu Arae c), Rocinante (mu Arae d) and Sancho (mu Arae e). This proposal, with the hashtag #YoEstrellaCervantes, is also supported by the prestigious Instituto Cervantes, the public Spanish institution that promotes the Spanish language and culture around the world. The “Instituto Cervantes” has headquarters in 90 cities of 43 countries, Sydney included. Artistic representation of star mu (μ) Arae and its planetary system. 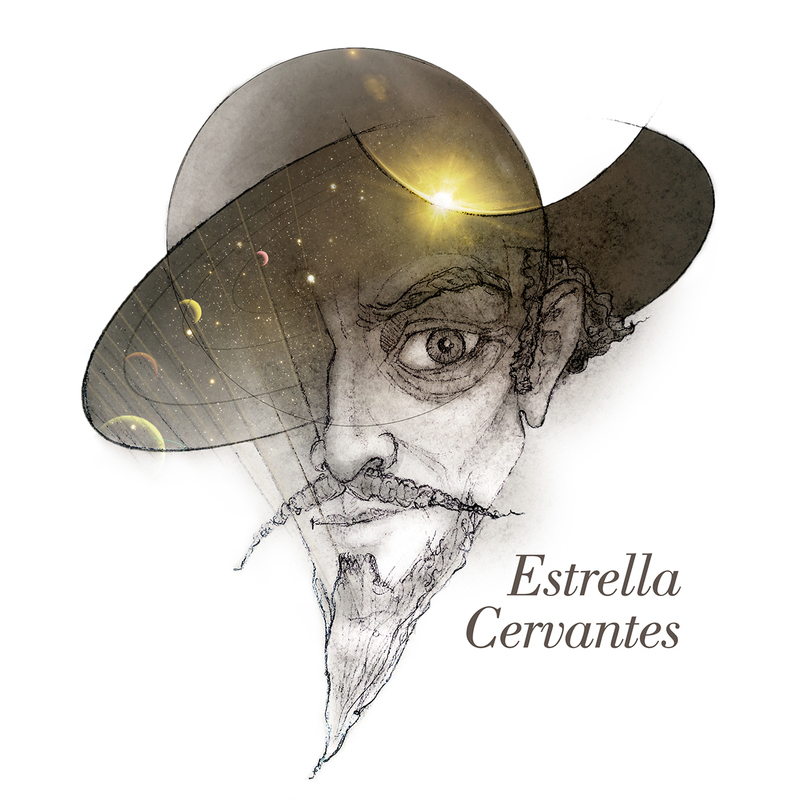 The #YoEstrellaCervantes initiative proposes to name this star as Cervantes and its planets Dulcinea, Rocinante, Quijote and Sancho, following the main characters of Don Quixote (“Don Quijote” in Spanish). and clicking in the “vote” button for Cervantes. You can also ask your friends and relatives to vote #YoEstrellaCervantes and help put names to these 20 planetary systems. You can cast an unique vote per system per device (laptop, computer, tablet, smartphone). Remember the deadline is next 31st Oct. 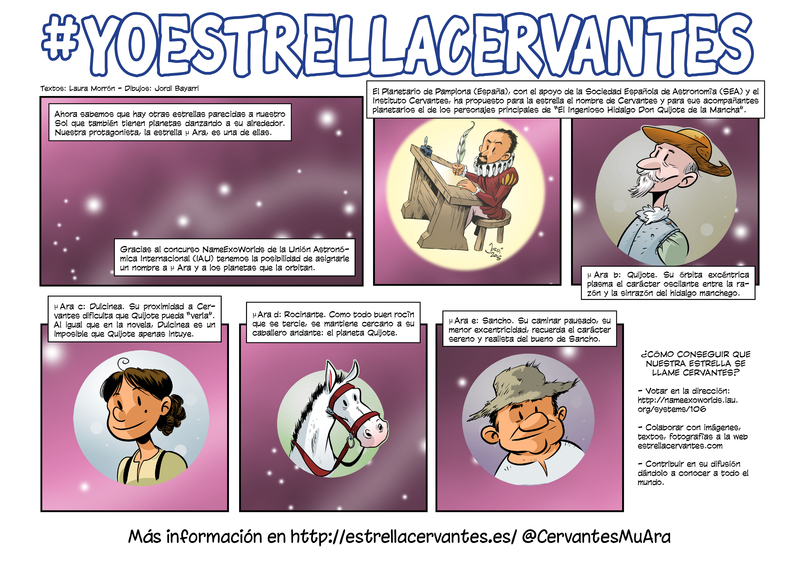 The website http://estrellacervantes.es/ compiles, in Spanish, all the information about #YoEstrellaCervantes, including news and related activities. One of my favorite initiatives was created by Laura Morrón in collaboration with comic illustrator Jordi Bayarri and teacher Juan Carlos García-Bayonas. They developed a comic and great didactic material to promote #YoEstrellaCervantes in the classroom. Their material put together Science and Literature with the aim of approaching the #NameExoWorlds and #YoEstrellaCervantes initiatives to young students (and their parents). Comic promoting the #YoEstrellaCervantes proposal for star mu Arae. Credit: Text: Laura Morrón, Drawings: Jordi Bayarri..
Where is mu (μ) Arae located in the sky? 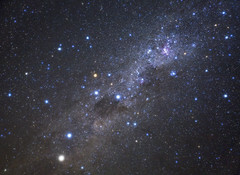 This star belongs to Ara constellation (the Altar), a region of the Southern Sky between Scorpius (the Scorpion) and the Triangulum Australe (the Southern Triangle). Hence, this constellation cannot be seen in the majority of the Northern Hemisphere (although it was already described by the 2nd century astronomer Ptolomey as one of the 48 Greek constellations). Seen from the Southern Hemisphere, this region of the sky is spectacular. Mu Arae has a visual magnitude of 5.2, therefore, although being a faint star, it can be seen with the naked eye from dark place. However, because of the huge number of faint stars found within these constellations (which are located very close to the Galactic Plane), it can be a bit hard to accurately identify mu Arae under a very dark place, far from the light pollution. 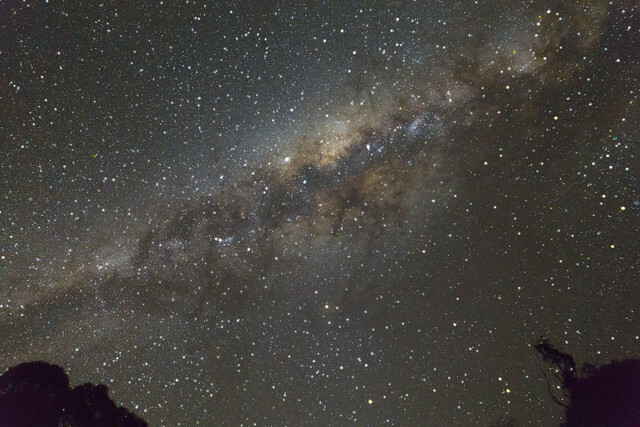 The Milky Way as seen from Siding Spring Observatory (NSW, Australia). This image was the very first astrophoto I took with my new camera, a CANON EOS 5D Mark III, last 7th September. I used a 24mm lens, F2.8, with 30 seconds exposure. 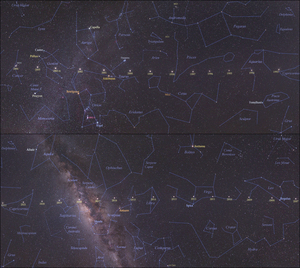 A zoom-in of the previous image shows the location in the sky of the constellations of Scorpius (Right) and Ara (left). Star mu Arae is identified by a yellow open circle. 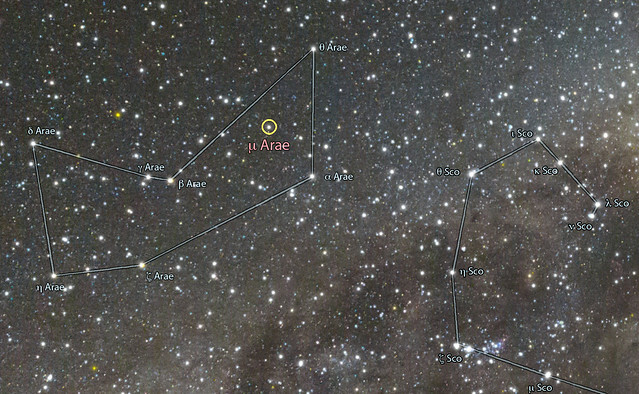 Another zoom-in of the image now only shows the details of the Ara constellation and mu Arae surroundings. The brightest stars in Ara and in the tail of Scorpius are also identified. Today, September 29th, is the (assumed) anniversary of the birth of Don Miguel de Cervantes Saavedra. Using this as a driver, the SEA has released the campaign ¿Te atreves a regalarle una estrella a Cervantes? (Why don’t you give a star to Cervantes? ), that aims to promote the #YoEstrellaCervantes proposal for star mu Arae. We are asking citizens around the world (and not only Spanish-speakers, but of course mainly orientated to them, as the majority it is in Spanish) to help us to get the hashtag #YoEstrellaCervantes trending topic in social media today. Besides casting your vote, please share #YoEstrellaCervantes in your social network to reach more people. Logo of the #YoEstrellaCervantes initiative. The book “The Ingenious Gentleman Don Quixote of La Mancha” (“El ingenioso hidalgo don Quijote de la Mancha”), or just Don Quixote (“Don Quijote” in Spanish) was published in two parts in 1605 and 1615. Hence 2015 marks the 400th Anniversary of Don Quixote, which has been considered one of the most influential works of literature, one of the best works of fiction ever written, a classic of the Western literature, and to be the first modern European novel. The initiative #YoEstrellaCervantes is a beautiful project that puts together Science and Art (Literature) and a tribute to Don Miguel de Cervantes and his work. If Shakespeare already has his works in the heavens (the majority of the Moons of Uranus are named after characters from the works of William Shakespeare), why hasn’t Cervantes?